Business accelerators in Silicon Valley (CA), Boulder (CO), and across the US have been gathering the best young entrepreneurs, providing them the time, resources, and business connections necessary to start successful software companies. These accelerators have helped such success stories as AirBNB: now worth $2.5B and DropBox: now worth $8B. Can the lessons from software-focused business accelerators be modified to benefit commercial aerospace firms (referred to here as “Newspace”) that need to develop physical hardware (not just software) with correspondingly longer product development cycles? Are hardware-based accelerators possible? If possible, what would these accelerators look like? Below is an overview what accelerators are and my fourteen recommendations for enhancing the capabilities of Newspace accelerators. For many, YCombinator wrote the definition of what an accelerator is. Located in the Silicon Valley, YCombinator helps software startups succeed. Twice per year they bring in a bunch of startups (from thousands of applicants) and invest in each firm ($20K for 3-7%). In the early days, only a few firms were funded, recent batches have included over sixty startups in a single batch. Over the course of three months (the length of the “batch”), YCombinator helps startups mature. Some firms need help with an idea for a product, others with introductions (access to the YCombinator Rolodex), still others need help navigating the pitfalls of a growing software startup. Each batch culminates in Demo Day where each startup pitches to venture capitalists (and occasionally, Ashton Kutcher). Both Air BNB and DropBox (mentioned above) were accelerated via YCombinator. Many of the companies in each YCombinator batch…FAIL. But the YCombinator assumes this failure will happen. The compensation from wildly successful firms more than compensates YCombinator for the cost of the failed companies. Since YCombinator does not know who will be successful at the outset, if the entrepreneur team is accepted into the YCombinator program…they get funded. a “startfund” (the capital that gets invested in each firm). For simplicity, I will use “Accelerator” generically throughout this post to mean the combination of both advice and capital. 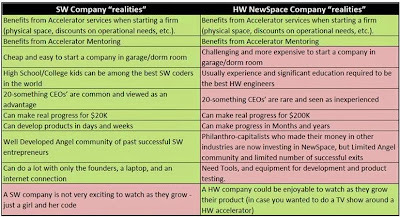 Organizations have already begun the good work of porting the software accelerator model over to Newspace hardware startups. Two examples include: Silicon Valley SpaceCenter and Space Tango. Silicon Valley Space Center is a Newspace accelerator in the heart of software country (Sean Casey, Managing Director). They provide frequent events (Hackathons) and networking opportunities. But although SVSC makes introductions to angel capital, they lack a startfund of their own. Space Tango is a more serious attempt to mirror YCombinator. Space Tango has three month “batches” where participants relocate to Kentucky for a 12-week training program. Space Tango has a startfund ($20K for 5% equity), with follow-on rounds possible. Space Tango offers mentoring and accelerator services, but is a young organization, having only raised a $100K startfund to date. The announcement of Space Tango’s initial batch should be made in the next few weeks. 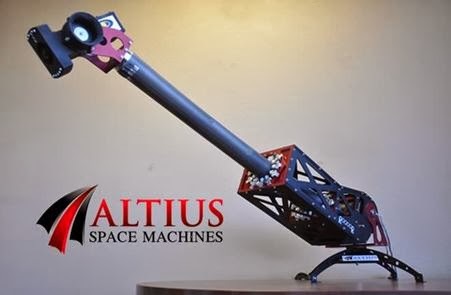 Interview with Jon Goff, Founder & CEO of Altius Space Machines on what he would have wanted in an accelerator for his own startup. 1. Low Capital to Start. Reducing the Capital requirements necessary to successfully fund a Newspace startup is a goal that both focuses the mind of Newspace entrepreneurs and focuses the efforts of support organizations like business accelerators. For most entrepreneurs, proposing the business plan that requires hundreds of millions of dollars to execute and needs only one starry-eyed billionaire to agree is NOT a good recipe for repeatable success. Even when the entrepreneur proposes a manageable business concept, accelerators add value by reducing costs for infrastructure services (e.g. office space, etc.) or access to capabilities that startup would normally not be able to afford (e.g. vacuum chamber for testing prototypes). YCombinator has brokered a deal with Comcast to provide each startup extremely fast internet connection for their three-month stay in Silicon Valley. What are the services from which a Newspace startup would most benefit? 2. Speed to Market. Minimal Viable Product (MVP) is a term common in software startups thanks to the work of Steve Blank and Eric Ries. Like the name suggests, MVP’s push a startup to get a product into the hands of customers as soon as possible. The MVP joke is if you’re not embarrassed by your MVP, your MVP is too mature. MVP’s give entrepreneur early revenue and, more importantly, they give startups feedback from customers. Although you don’t hear pharmaceutical entrepreneurs or nuclear power plant startups talking about MVP’s very often, the advent of Cubesats, NanoRacks-based ISS applications, and greater use of Commercial Off-The-Shelf (COTS) technology on space projects enable the MVP concept to be added to the Newspace startup lexicon. Two-year projects are preferred to five-year projects. Are their ways the startup can commercialize a subcomponent of their “Two-Year Project” and get to market in one year? As a general rule, faster to market is preferable. Note that faster to market will reduce capital requirements also (linking #1 and #2). 3. Capital and Liquidity Opportunities. How do we get Angel investors in an industry? Altius’ Jon Goff said something profound in a Thruster issue about a year ago that has stuck with me. In other industries like tech, a good-sized portion of the industry’s Angels are created from successfully exiting entrepreneurs that now have experience and capital and still want to be involved in the industry. However these successful entrepreneurs are not ready for the hard work of starting a second startup. The profound part of Mr. Goff’s article is acknowledging how few exits Newspace has to its credit – thus the number of industry Angels may also be reduced compared to other industries. While industry loyalists wait for the Angels to arrive, an accelerator could be very helpful here, introducing Angels from other industries to Newspace. This work would supplement the good work the Newspace Global and many others are already working in this arena. As discussed above, YCombinator not only offers capital from their startfund, but also brokers countless introductions between startup and capital sources. With each introduction, YCombinator’s capital rolodex grows. With each successful startup to graduate the program, YCombinator’s alumni network grows as well. Both are important. 4. Industry Awareness. Newspace, focused on commercial aerospace projects, would greatly benefit from a higher industry profile. Many still are unaware of the unshackling from Government contracts that is underway within the aerospace industry. Accelerators can help significantly here. By aggregating Newspace startups into a single effort, accelerators may be more influential to news organizations and those peaking over the fence into Newspace from the outside. In the same way #1 and #2 are linked. Note how #3 (capital and liquidity) are linked to #4 (industry awareness). Makerspace (free tools, supplies, and office space) run by the Accelerator. Because the cost and time to develop a prototype, aerospace firms have a tendency to develop elaborate PowerPoint files, predisposed to take contract money before engaging in any significant prototyping. And when the industry does build, they over engineer since “this has to work” and often the project lacks prior iterations to leverage. Chris Anderson, in his book, Makers: The New Industrial Revolution illustrates how accessible manufacturing technologies are to the average person. Jon Goff reinforced this point when describing the makerspace Altius uses in Denver and the 3-D Printer they use in the office. Make these tools available to startups within your Accelerator. I envision a facility that combines co-working space with a common makerspace area to access shared tools for R&D manufacturing. What would you do if a laser cutter were as accessible as PowerPoint? The ethos of the startup changes from talking to doing, from PowerPoint to building hardware. Small product/service. Accelerator advisors should HIGHLY encourage their teams to think smaller. Less to develop – reduced capital requirements - faster to market – probably faster to exit. I like the story Jon Goff tells. He wanted to develop an orbital propellant depot (gas station in space) so he focused on tugs which could be a major component of depots (depending on the architecture) and could be developed much less expensively than a depot. But tugs were still too big, too expensive for a startup develop, so Jon evaluated what elements of a tug he could make better. Believing rendezvous and docking technology was ripe for disruption, Altius invented Sticky Boom. Accelerator startups should be asking the same “downsizing” questions. Greybeard Mentor/Labor Team. Unlike software startups where a coder could be one of the world’s best before age 25, it takes time to develop as an aerospace engineer. And the aerospace engineers with real-world experience are highly prized. Under most scenarios, this type of experience is not available to Newspace startups. Accelerators could offer each batch access to a team of semi-retired “Greybeards” – engineers with hardware roving on Mars or orbiting Jupiter. Greybeards could review/critique plans by joining a firm’s advisory board or even play a more active role on startups that interest them. Partnership with local universities provide low cost graduate work force. Another cost-saving method would be to offer the batch access to competent part-time workforce to help move the MVP to Demo Day. I am not necessarily saying these same students would build the flight hardware that flies on the International Space Station (although some could). I am saying that free competent labor can help enhance a startup’s product offering by Demo Day. Good for the student. Good for the entrepreneur. Shared Admin Services. Using my Makerspace/co-working space as a model, batch-mates could share the cost of an administrative assistant. Jon Goff laments the number of hours he spent, in the early days of Altius Space Machines, doing “non-CEO activities.” They had to be done and there was no one else to do them. An admin assistant could help alleviate this problem and make Accelerator-empowered CEOs all the more productive. ZeroG Partnership – free/discounted parabolic flights. If YCombinator gives Comcast Business-class internet service to their batch-lings, then a Newspace accelerator could offer services like those listed below to help Newspace startups: (1) Suborbital Partnerships (Armadillo, Masten, etc) – free/discounted suborbital flights (2)NanoRacks Partnerships – free/discounted ISS flights (3) Access to major aerospace testing facilities (Boeing, a major university, etc.) (4) Low cost business solutions offered at a discount – even Newspace startups would like to have Comcast Business internet. ITAR Lawyer services FREE. Worth mentioning here, unlike most software startups, Newspace startups need to be aware of International Traffic in Arms Regulations (ITAR) and develop strategies to not run afoul with the State Department. Many of these startups would benefit from lawyer services to help navigate the ITAR swamp. An Accelerator can help facilitate this. Market Analysis and Biz Model Development Support (Newspace Analytics, Newspace Global, etc.). Another service that would help young startups would be assistance in developing a business model with profit potential. Firms like Newspace Analytics and Newspace Global or accelerator in-house services would be very valuable to the entrepreneur. Lessons from Clean Tech. In preparing this post, I interviewed Interview Jeff Lints, Director of Operations, of the Energy Fellows Institute. The Energy Fellows Institute looks to bring accomplished C-Suite executives or second-time entrepreneurs from other industries into Clean Tech. Recognizing the challenge in attracting the best and brightest innovators to clean tech, the Energy Fellows are influencing the quality of the entrepreneurs in their industry through a similar accelerator-type program. Newspace shares many of the same challenges to Clean Tech. Newspace entrepreneurs may value greater participation from accomplished C-Suite executives and successful second-time entrepreneurs. Imagine preparing for Newspace Demo Day where the entrepreneur is not only trying to woo potential investors but is also interested in attracting a COO/CFO/CEO from a stable of qualified candidates. These C-Suite candidates have been watching each firm in the batch throughout the term. Convincing one of them would, not only help your startup make better decisions, but also help close on the next round of funding. $200K up-front investment. In the early days of YCombinator, they traded ~$20K for 3-7% equity. Recently, they have increased their funding levels via a convertible note. Space Tango is also talking $20K of capital offered to each startup (although Space Tango has hinted at the possibility of follow-on financing for those Newspace startups with promise). So what is the appropriate capitalization level to enable startups to develop/test real products? Jon Goff helped considerably here. Mr. Goff recommended $200K for each startup. This would cover early hardware R&D work and labor costs (the two largest expenses for early hardware startups) at least through Demo Day. The $20K offered by several current accelerators is too small, if the intend of the capital was to truly produce a near-term MVP. Six-month Batches. Both YCombinator and Space Tango offer an intense 3-month on campus experience for their batches. A six-month cycle acknowledges that hardware takes longer to create then software code. The six month batch also gives time to schedule testing via zero-g, suborbital flights, and local universities and large aerospace firms. Such testing would be much more difficult to include if the program only lasted 3 months. Demo Day. Without the lure and threat of a room of VC’s/Angels waiting for each startup’s presentation at the end of the batch, startups within the accelerator lose a strong forcing function. A Newspace accelerator should put special emphasis here – the accelerator’s value to each startup will be heavily impacted by the quality of VC’s and Angels the accelerator can attract to Demo Day. For most startups within the program – every decision should be made with Demo Day in mind. Newspace Accelerator for a better Newspace industry. Although not required to be an accelerator, using the accelerator to promote the industry as a whole is strong way to grow the pie. TV Documentary/Reality Show for each batch. Again, not required. But with the success of ABC’s Shark Tank there appears to be an appetite for shows about entrepreneurs striving to make to succeed in business against all odds. This may be one area where Newspace actually has an advantage over Silicon Valley and YCombinator. Watching a startup team operate an welder, see a 3-D printer manufacturing parts and watch real hardware get tested on a suborbital rocket flight is much more satisfying television than overseeing a twenty year-old writing code in his apartment while eating Raman noodles and drinking Red Bull. These ideas are expensive. If an Accelerator offered $200K to five ventures per batch, that is $1M per year in equity capital investment. Plus another $1M in operational costs to maintain the makerspace/co-working space, staff salaries, testing assistance for startups, etc. $2M in annual obligations may be challenging to achieve. However, an underfunded Accelerator loses much of its value and thus loses much of its appeal. Dream with me. After months of interviews and intense deliberations, SpaceCombinator selected its latest batch of Newspace startups. Co-locating to Boulder, CO was an issue for some, but in the end the value of the six-month program, the access to all of the major aerospace firms along the corridor to Denver (and the occasional trip to the mountains) made the co-locating rule manageable. $200K for 15% equity stake gave each selected firm an immediate $1.3M valuation. SpaceCombinator chose the majority of firms for their ideas, but a few firms were selected because the selection committee was impressed with the founders (even while the product idea needed to be rethought). Over the six-month batch, the firms worked with staff to develop products customers will buy. A few firms switched products after R&D efforts indicated a needed pivot. SpaceCombinator provided a steady stream of guest speakers from both small and large aerospace firms at the weekly dinners. NASA spoke one night. DFJ’s Jurvetson spoke one night. The in-house makerspace enabled a quick validation of design assumptions, and made conversations with customers more productive with tangible prototypes to discuss. The teams were constantly iterating (iteration has always been the best type of failure). Hardware tests were conducted via partnerships with the big aerospace firms. One firm even flew suborbitally (twice). Another batch-mate is on the manifest for an upcoming NanoRacks flight to the ISS. SpaceCombinator’s alumni list is growing. With a handful of successful exits and several dozen going concerns, alumni firms share a special bond with the current batch and look for ways to help these startups in the same way they were helped by even earlier batches. Greybeards, SpaceCombinator’s group of seasoned veterans, taught several founders to weld, helped two startups understand the complexity of ISS-based deployments and introduced at least one firm to those within NASA’s ISS-utilization office. The separate group of C-Suite executive veterans made the rounds to each of the startups. They gave advice, asked questions, listened to Pre-Demo Day pitches. One exec did not wait for Demo Day, she accepted an offer to join one of the firms as CEO. The firm’s founder was only too willing to move to the CTO role to make room for the more accomplished CEO. An unforeseen benefit has been the amount of cross-fertilization of ideas and methods that has come from co-locating the startups at the makerspace. Teams come out of their offices to see what their batch-mates are working on. All are motivated to build more and do more when others are watching. And it all culminated in Demo Day. NASA, Angels, VC’s, Lockheed Martin, Boeing, Northrop Grumman, Ball, NanoRacks, and others were all there. Each firm in the batch took turns sharing slides and demoing hardware. One firm had only that – a vision and limited HW model to show for their six month effort. But several had strong stories of flight-demonstrated hardware, paying customers, and a plan for growth and profits. One firm could already announce true revenue with presales from an upcoming commercial rocket flight. SpaceCombinator took the concepts pioneered by software accelerator and made them work for hardware startups going to space.